After listening to the Wardcast podcast which gave a nice shoutout to You Are Jeff Bezos (thanks, guys!) 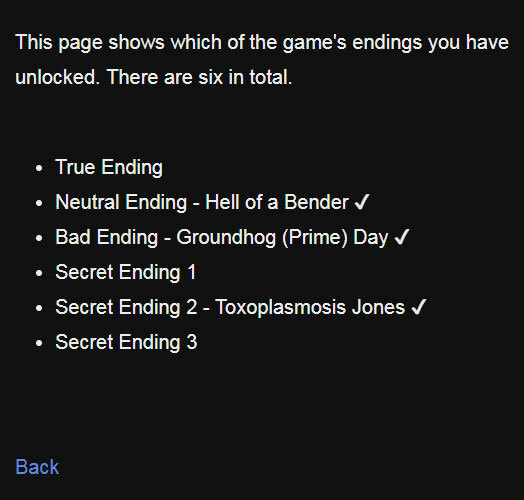 I realized it might help players to have an in-game system to keep track of which endings they've unlocked. Now, after you've completed the game the first time (no matter which ending you get) a new link will appear at the bottom of the intro passage. This takes you to a separate passage listing which endings you've acquired. It SHOULD theoretically remember between browser sessions but it'll depend how your cookies are set up, I think. The philome.la version has been updated as well. Ooh and hey, I have another game coming out on the 21st! That's like, soon! I hope you play it and like it.